Nice example of the bolo bayonet. Very very rare! WOW is that part of your collection? It must be an original and how much did you get it? Were did you get that gem? It looks really nice quality. What a marvelous photo!! A truly beautiful artifact! Thank you for capturing, and preserving this image from E-Bay for us to admire. load. We were soon to find out that initial appearances could be very deceiving. The Model of 1902 Bolo Bayonet is actually well documented in design and background. 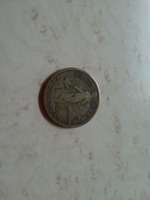 Originally designed and produced by Captain Hugh D. Wise Quartermaster, 9th Infantry, United States Army in 1901. Capt. Wise proposed the idea while serving in the jungles of the Philippines so this was an actual field evolved tool not something dreamt up in a lab or pattern room of some arsenal. Major Wise served on Samar at various times from 1901 to 1906. Samar was the place where almost all of Company C., 9th Infantry was wiped out in a surprise dawn attack. The order given from Brigadier General Jacob Smith to Major Littleton Walker, USMC, Commander of a Brigade of Marines was "I want no prisoners." " I wish you to kill and burn. The more you kill and burn the better you will please me. I want all persons killed who are capable of bearing arms in actual hostilities against the United States." To say the fighting on Samar would be brutal and savage would be an understatement. In letters exchanged with the Ordnance Department Wise relayed information about actual experience fighting with the bayonet, both the Bowie version and the typical Model of 1892 then issued with the U.S. Magazine Rifle. 1st. That it could easily be withdrawn from the body of a man who has been killed with it, since the cutting edge of it would slash a wound sufficiently large to allow the bayonet to be withdrawn and would also cut its way out as it is withdrawn. In this connection attention is invited to the fact that in the engagement of the Gandar River, Oct, 17th, 1901, several men of Company E, 9th Infantry while trying to extricate their bayonets from a dead enemy were killed by another, and all complain that the present bayonet can he withdrawn from a body only with the greatest difficulty. 2nd. 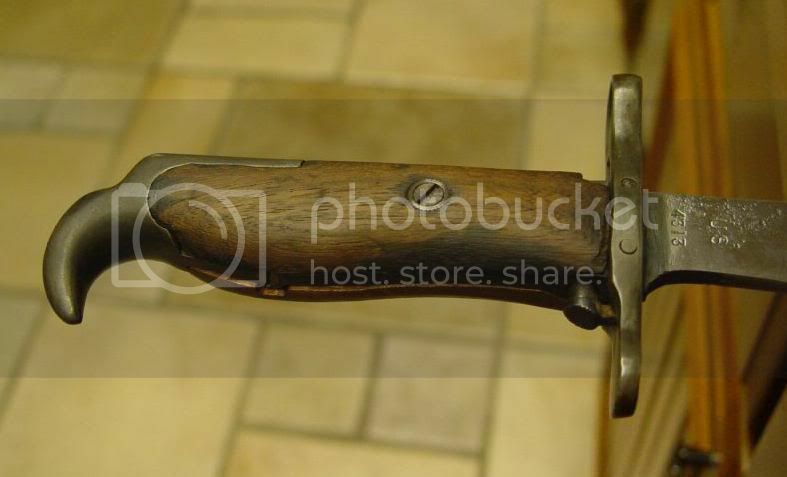 This bolo-bayonet has all the properties of an excellent working bolo with which the men can cut their way through jungles, cut wood, or use for any of the other manifold purposes for which a bolo or hatchet is used. Its breadth, shape and strength make it a far better entrenching tool than the present bayonet. It is believed that a slightly increased weight is not sufficient to offset its many other advantages. Without the weight it would be as useless for chopping vines and jungle as the present bayonet and it is certainly better that troops should carry a useful implement and weapon of 25 oz. than that they should carry a comparatively useless on of 21 oz. disposition or action as the Commanding Officer may see fit. It is suggested that perhaps the Ordnance Department might make a few of these bolo-bayonets of good steel for trial. The one which I forward is very roughly made and is of very poor material. It is requested that should the Ordnance Department see fit to do this they should confine themselves closely to the weight, shape, and dimensions of the model which has carefully selected. 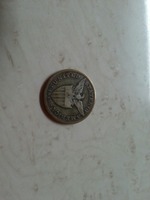 an additional 6 were made up in calendar year 1903 but stated in the Springfield Record as Fiscal Year 1904. These specimens will be dated 1903 for the actual calendar production year. They were sent to the Engineer Board for testing as an intrenching tool as the imminent replacement by the rod bayonet for the new rifle was near. It should be noted that these items were made up years before Springfield started serial numbering bayonets. A serial numbered Model of 1902 Bolo bayonet should be looked at with suspicion of being a fake. elements. These scabbards were entirely made at Springfield and used the current Model of 1899 attachment device. The throat portion of the scabbard held a plate that would only allow the bayonet to enter in one direction, it was cut to fit. As the scabbard is rarer then the bayonet these too are made as reproductions. The Wise pattern Model of 1902 Bolo bayonet scabbard. fraudulent Model of 1902 bayonets are made. the Ordnance Department went straight for the knife bayonet theory. is very much like the Wise 1902 pattern but longer in blade length. herewith was not made exactly like desired by the instructions in O.O. bayonet with a large belly at the end that mimics the Wise pattern. the complete bayonet is finished bright and workmanship is impeccable. American Bayonet showing the attempts at a bolo bayonet. for this example. Too many problems existed to correct this design. fill. This arrangement would have the hand blistered in a few swings. 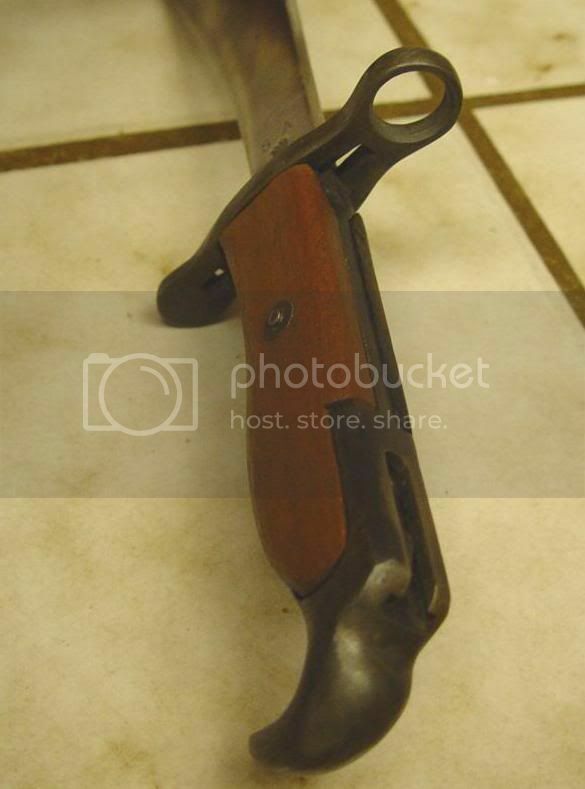 the Model 1915 Bolo Bayonet. with the original prototype built back in the Manila Ordnance Depot. retainer give good pressure and be made of a non corrosive material. surviving example is here, the only one I know of to still exist. and scabbards being ordered for issue to the Philippine Scouts. is shown in a photograph here with the grips off. designed to employ the catch but for reasons unknown it was not used. the bayonet directly from Hardin is well written and appropriate here. Ordnance Escutcheon / "1916". The blade is finished bright." Manila and the remaining 202 were shipped to Rock Island Arsenal. Scout unless a local made proper bolo were to be exchanged for it. following suggestion was made by the Colonel of the 26th Cavalry (PS). and has yet to be discovered by this author. Thanks for the info Philip. Do you think a reproduction for this can be made in the Philippines to outfit Guy Hilbero's troop? The surplus can be sold abroad to finance the equipment requirements of the 26th memorial regiment. I'm sure it can be made in the Philippines. Specially daggers and bolos. It's a just amatter of again having the correct accurate sample for them to copy the specs. then finding and supervising the correct craftsman to do get it correct. This is again the hardest challenge to supervise and make sure they do it right. The folks we know back there do not have the transportation to make it happen. WOW!!! That is freakin awesome! I always wanted to see clearer photos of this bayonet. I knew it fetch in the thousands also. Is the auction over? Thanks for sharing! Auction over about 3 years ago. HAHA! Oh dam! Didn't know this thread was that old and never seen it before. Interesting some of the things that are hidden in this forum. Thanks for bringing this thread back to light. 3k for a bolo bayonet 3 years ago...im sure it is more now. There was another one on ebay since this one was listed. It also sold for thousands. Does anyone have any plans to make a repro of these bayonets and scabbards?? I assume we need to have at least one original copy to make a decent reproduction. An original one costs thousands.... sigh. Anyone know anyone that can make one of these?? I think Col. Shawn Welch was going to have some made a few years ago. I don't know what came of it but he must have access to measurements or blueprints. Red, you one lucky... What area or town do your parents live? Just wondering because the 26th Cavalry Phil. 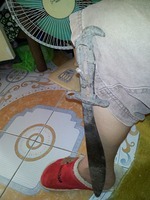 Scouts used this type of bayonet and they were based in Fort Stotsenburg, Pampanga. Of course they fought all over the place. I wish your bolo could talk. 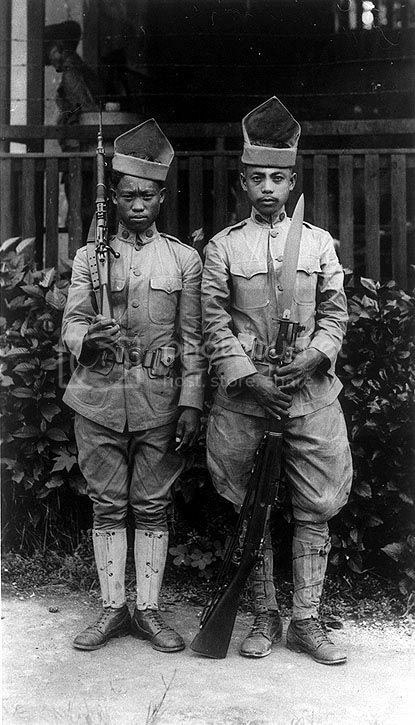 It was most likely used by a Philippine Scout cavalryman!